Ever thought there could be a tropical oasis, a Margaritaville of sorts, in good old Glens Falls? Now there is, and folks, it really is a good time. 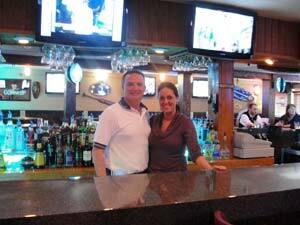 I had the pleasure of sitting down with Jaylene and Perry Leonbruno, owners of JP Bruno's Bar and Grill. They are seasoned pros that have been in the bar business for over 17 years and are owners of Good Times in Hudson Falls. Here are some of the things I learned about this brand-new establishment on the "street of dreams". For starters, Perry's hometown is Glens Falls and he loves it here. "I want Glens Falls to be a small Saratoga and there is no reason it can't be." JP Bruno's isn't the only establishment on South Street that is helping in this movement. Revitalizing the street one building at a time is the first step to beautifying South Street. With more and more buildings being renovated and a new facade in the works for local classic New Way Lunch, we are slowing seeing a positive turnaround to South Street. I popped into JP Bruno's during their soft launch. The vibe was casual, comfortable, and best of all, tropical. "I'm a beach girl!" Jaylene said. "I want customers to feel like they have gone on vacation for a couple of hours. If I could bring sand in for the floors, I would!" Plenty of room at the U-Shaped bar, high top tables, 18 televisions, and a roomy dance floor area makes for a great space! Tropical mementos Jaylene picked up on her many trips to the Caribbean decorate the walls, including her favorite wood carving of Bob Marley. What you won't find here is trouble. The Leonbruno's want their customers to feel comfortable and safe. They are making a conscious effort to check any bad behavior at the door and keep it out for good! Not only that, if the staff has to turn someone away for misbehavior, Perry wants to make it right by alerting his fellow bar owners that trouble may be coming their way. From specialty margaritas, Caribbean beers, American classics and local brewed favorites, you can find just about everything at JP Bruno's well stocked bar. For local flavor, they will have an entire section devoted to favorite drafts by Davidson Brothers and Coopers Cave Ale. This is just one of the ways Jaylene and Perry are giving locals what they like while at the same time supporting other community business owners. For Jaylene and Perry, it really is all about the community. "We're all about supporting each other." Perry said. They are all about chipping in and helping each other out. This sense of community and camaraderie has already paid off. The bar has already been a after work hangout spot for local bartenders from The Bullpen and O'Tooles. JP Bruno's opens for lunch at 11AM and serves food all day! Enjoy casual pub fare - everything from wings, sandwiches, pizza, burgers and salads as well as finger foods like fries, pretzels, chicken tenders and mozzarella sticks. From casual lunches, to entertaining happy hours, to late night dancing... you can find it all at JP Bruno's Bar & Grill! Stop by, get comfortable and say hi to Jaylene and Perry. You'll be glad you did! Live music by local bands and DJ's Wed-Sat. Specials all week long including Margarita Mondays, Tuesday is Blues Day (Blue Moon Special - Perry's favorite! ), Ribs & Reggae Wednesdays, $3.00 Thursdays and Live at 5 Fridays!